The good news is that electronic cigarette manufacturers continue to develop the product to fulfill the needs of the vaping community. The bad news is that there are now hordes of different options out there to try and sometimes the variations can get a little confusing. Tank systems are one area where a lot of new products have become available lately in a few different and incompatible configurations. 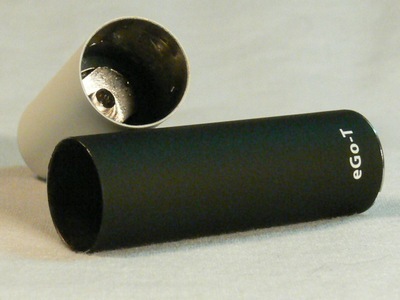 The eGo-T Type B from EVCigarettes is one such system that is made to be compatible with the eGo/Riva model of battery. The eGo tank system is built around an enlarged atomizer with a center wick tube that pierces a single hole in the compatible tank cartridge. “Ego-T” refers to the tank system and “Type B” refers to the cylindrical shape of the atomizer that is the same diameter as an eGo battery for its entire length. There is also a “Type A” atomizer that has a conical shape and is not interchangeable with Type B tanks. The most obvious benefit of the tank system is its huge capacity. The Type B tank easily holds 1.8ml of e-liquid and will probably hold almost 2ml filled to the brim. That’s enough liquid to suit most vapors for an entire day at work. When I think back to the 7 drops or so that I could fit into my first M401 cartridges, the capacity is amazing. The larger diameter of the atomizer and cartridge make it possible to add all of this capacity with the addition of only 10mm to the length of the fully assembled eGo. The cartridges have a center hole through which liquid passes to the atomizer. Filling can be easily accomplished by inserting a syringe into this hole. 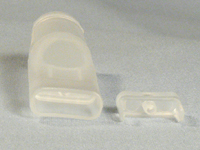 Closer inspection reveals that the cartridge is actually made up of three pieces and the reservoir cap as well as the mouthpiece tip can be easily removed. After removing the cap, liquid can be dripped into the reservoir. Regardless of how it’s filled, piercing the cartridge with an icepick or something similar where it will fit onto the atomizer is a good idea to avoid pushing the wick down. After that, simply press the cartridge firmly onto the atomizer. I do recommend blowing out the atomizer before inserting the tank; mine had a fair amount of primer fluid in them. It’s not harmful, but doesn’t taste great either. I was impressed with how well the eGo-T Type B system worked. From the start it delivered a large amount of vapor with no signs of drying out. Some tank users have had problems with the tank systems not wicking properly, but these worked perfectly with no adjustment needed. Lots of vapor is produced on every draw, although it is somewhat cool for my tastes. The atomizer heats up nicely, but the design of the cartridge that routes the airflow around the tank is likely having a cooling effect on the vapor after it leaves the atomizer. I didn’t notice much difference between the 1.8ohm low resistance and the 2.5ohm regular versions, although the LR atty felt a little warmer. One of the best features of the tank system is that, unlike cartomizers, flavors can easily be changed. Simply pour out the old flavor and pour in the new, blowing out the atomizer in between if desired. It’s a good thing, too, because this combination had me enjoying flavors that weren’t great when dripped on my usual LR 510 atty. Flavor production is good and certain nuances that don’t come out on hotter devices are now present. I am now enjoying some flavors that I had put at the back of the shelf. Another complaint that many users have had regarding tank style atomizers is that they leak. I have been using this one for a week now, taking no special care with it and it has not leaked a drop. Only time will tell if leakage becomes more likely as the components wear, but I am happy to see no evidence of the issue at this point. The only problem that I noticed was that a little juice did build up in the mouthpiece, but the tip snaps off for easy cleaning, making this no problem at all. Tank atomizers are a great option for vaping on the go and the B Type is a well designed version. With the ability to hold almost 2ml of eliquid, these are capable of turning an eGo/Riva into a zero maintenance all day device. The trade off for me is that the vapor is not quite as warm as I would prefer, so these will likely be relegated to times where I can’t drip, but they are perfect for those occasions. Look for these eGo-T Type B atomizers at EVCigarettes, and don’t forget to use the coupon code “vapingguides” at checkout for 15% off your order. In the spirit of full disclosure, Celestino at EVCigarettes was kind enough to send me regular and LR versions of the tank at no charge to try out. 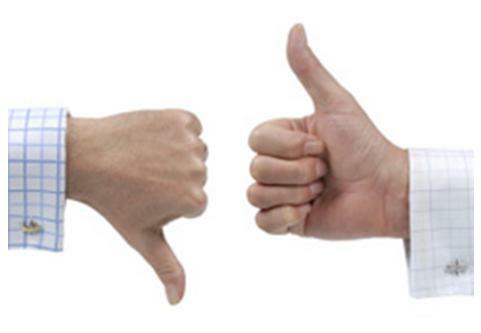 I am always grateful for the opportunity to try new items, but do my best to not let it influence the review. I have the tornado T by wicked, am having probs with the atomisers only lasting a few days – a week athe the most, seem to get very hot quite easily, any advice/info? The biggest enemy of atomizers is burning too dry, so make sure you are keeping them wet enough. You mention that they seem to be exceptionally hot, though, which makes me wonder if you may have gotten a bad batch with too low resistance. If the resistance is too low, they’ll perform great, but only for a little while. I have been using the tank setup myself for a couple months now and love it. Flavors shine much more, and nowhere near the amount of work to keep a carto filled. I do recommend blowing out the atty at every refill, and the only leaks I have seen are after heavy pulls. You gotta vape easy as it pulls fluid into the atty as you take a drag, the heavier the drag the more the fluid… so heavy pulls can flood your atty and we all know where that ends up. Memorial Day Sale 05/24 - 05/30 | All Starter Kits, Joyetech Atomizers & 510 Cartomizers by Boge on sale!